A lovely letter left on our front doorstep, along with two rolls of insect netting. At a recent dinner party, good friends of ours were complaining that they don’t have any real sense of community where they live. They don’t tend to talk to the neighbours, and don’t connect up with other locals, even when at the school gate waiting for their kids. Ever since we started our vege patch in the front garden, we’ve met and chatted with folks from the surrounding area. When we’re working in the garden, five minutes doesn’t go by without someone saying ‘hi’ when walking past, or mentioning ‘I love your garden’. We’ve had many conversations over the front fence, about gardening, the local area and local gossip. One morning when opening the front door I found several rolls of insect netting, and the letter shown above. How nice is this! These are locals that we chat with, but they aren’t our close friends. So it’s lovely that they thought of us, and went out of their way to be of help. This entry was posted in Growing our own food, Local issues and tagged community, front garden, gardening, sense of community, vege patch. Two prizes for our edible garden. It’s always nice to have a bit of recognition for your efforts, so we were pleased to receive two 1st place certificates in Marrickville Council’s yearly garden competition. The first was for the “best edible garden”, while the second was for the overall “water efficient garden award”. This entry was posted in Uncategorized and tagged gardening, summer. Last week I was in Vancouver (Canada) for work, and in amongst the conference and meetings I had a chance to walk through most areas of the city. It’s a lovely city. It’s also interesting to see little patches of greenery popping up in unlikely spots. This includes a green roof on top of a skyscraper (above), and community gardens squeezed into unused spaces (below). There were also a few rain gardens, which looked to have been installed as part of the preparation for the Winter Olympics, which were held here a few years back. Say what you like about top-down policies and strategies for addressing climate change. Even in the absence of these, cities around the world are undergoing a quiet revolution that is connecting people to communities, food and the environment. Community garden alongside disused railway tracks, south of the CBD. Community garden, right in the heart of the city. 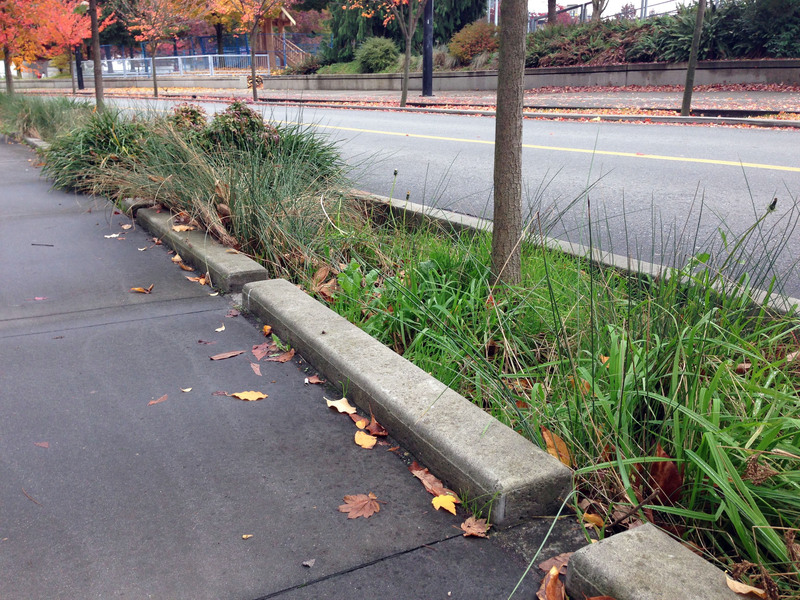 Rain garden, near Vancouver’s stadiums. Large scale urban agriculture, right at the foot of the huge stadium. This entry was posted in Uncategorized and tagged community gardens, gardening, green roofs, rain gardens, Vancouver, verge. Now that’s a big pile of compost! I recently ordered a large delivery of compost, to be mainly used in the guerrilla gardened space behind our house. Much of that soil is heavily depleted, and I wanted to give our fruit trees the fastest rate of growth this year. Why order such a big pile? For the simple reason that it cost $51/m3 to buy in bulk (plus a delivery charge), compared to $9 (or more) per 40L bag if purchased at a garden centre (or Bunnings for that matter). And a it takes a lot of 40L bags to make up a cubic metre of compost. That’s a big saving! This time around, I purchased the compost from Australian Native Landscapes, who have a nice range of recycled products. Humus rich, 100% organic compost is specifically designed to build soild carbon levels and soil microbial activity. Apply 75mm and dig into tired, nutrient poor soils. Suitable for all plants, this compost is particulary beneficial for phosphorous sensitive Australian natives. This entry was posted in Growing our own food and tagged compost, gardening, recycling, spring. We were recently given a pile of 2nd hand books, about organic gardening and healthy eating. They mostly date to the 1970’s, published in the UK or the USA. One of the books was “How to grow food organically”, shown above. There’s a bunch of good stuff in it, although not presented in an easily digestible way. It’s an advertising insert … for cigarettes!?! … and over the page. Yes, that’s an advert for cigarettes, within an organic gardening book. “Stop poisoning yourself and your environment!” says the cover of the book. Except for the cigarettes, of course. Times have changed since 1972. This entry was posted in General chit-chat, Growing our own food, Saving the environment and tagged books, gardening, organic. Stripped down to its simplest form, this worm farm should now last! As a novice gardener, it’s hard to think and design for the long term. Things going into the garden need to last not just for months, or even years, but perhaps decades. Our consumer society also tends towards fancy solutions that aren’t robust. Our worm farm is a perfect example. I’ve had it for years, and it was a lovely solution. It sat on my balcony, resting on four legs. Sliding doors gave access to the vermicast, and there was a tap to draw off the worm juice. The tap was the first thing to go, when it clogged up and stopped working. When shifting the worm farm on the balcony, one of the plastic legs broke off. Then when moving it to our new house, I discovered that the bolts holding the sides together had rusted into a mass of iron. When we got it to the house, I abandoned the three remaining legs, and sat it on a row of bricks. But over time, the whole thing sank into the ground, at an angle, so the lid didn’t go on properly. So with my new-found renovation skills, I made a small concrete pad for it, as shown above. The base, with its broken tap, was finally discarded. The result: four sides and a lid, sitting on concrete. This will last! This entry was posted in Growing our own food, Saving the environment and tagged compost, gardening, worm farms.